By GIS/Defense & Foreign Affairs, Buenos Aires. Significantly, the U.S. has not ratified the UN Convention on the Law of the Sea (UNCLOS) and therefore is not a member of the CLCS, but, as with the UN’s International Criminal Court (ICC, to which the U.S. is also not a signatory), Washington works to exert pressures on and through these UN bodies. The timing and nature of the CLCS “ruling” on Argentinean territorial waters, then, came as no surprise to President Obama, even before his Buenos Aires visit. The CLCS ruling increases Argentina’s claimed continental shelf jurisdiction by 1.7-million sq. km from its current 4.8-million sq. km, and refers to the area from the 200 miles exclusive economic zone limit to the shelf slope, an additional 150 miles. 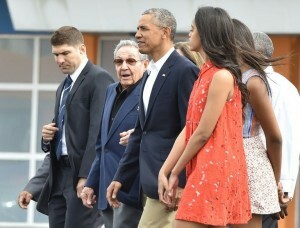 President Obama has exhibited a lifelong antipathy to British colonialism and 2016 represented the last year of the Obama Presidency, and his ability to make “history on the ground”: hence his visits, particularly, to Cuba and Argentina. The degree to which the White House prompted and supported the CLCS decision regarding Argentina through U.S. Ambassador to the UN Samantha Powers is still under investigation. The Argentine submission to the CLCS was lodged in 2009 (although work on it was begun by President Carlos Menem and Foreign Minister Guido Di Tella in 1995), and has, not surprisingly, been monitored by the U.S. government. However it is significant that the ruling on Argentina’s continental shelf and related claims to offshore waters will, while creating a new impetus toward competition between the UK and Argentina over the legal ownership of the Falkland Islands, also put in place a continental shelf claim validity for Canada to the possible strategic detriment of the United States. Of course, the extension of Argentina’s claims to the continental shelf off its coast do not diminish, equally, the claims for the territorial waters rights of the self-governing Falkland Islands themselves. To suggest otherwise would imply, for example, a range of other claims. The ruling — which thus far is not seen to have a direct impact on the sovereignty of the Falklands — will also be viewed with some concern by Greece, which has sovereignty over a range of Ægean islands, some close to the Turkish mainland. This was well understood by the White House, which, despite occasional tactical differences, is fiercely loyal to current Turkish President Reçep Tayyip Erdoğan. Nonetheless, the UN ruling was a shot across the bows of the UK, a shot which was pointedly supported by U.S. President Barack Obama. The most immediate impact would be on the attractiveness of foreign investment in the exploitation of the Falklands’ offshore resources until some clarification is given on what actual rights are implied for the Falklands themselves. It is possible that one option would be the declaration of the Falklands as a sovereign state, remaining under the protection of the UK, or for the UK to be able to insist on its own EEZ rights for the Falklands to be ratified by the CLCS or under another ruling consistent with the UNCLOS.